Ron Paul deserves a high place in the history of liberty for being the only seriously principled statesman to serve in the US House of Representatives in the last quarter of the 20th century. It should not be a surprise to discover that Ludwig von Mises had a huge impact on Congressman Paul's view of statesmanship. 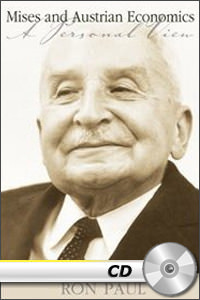 This essay is a moving tribute to Mises and a look into the mind of a remarkable politician. MP3 CD with no case!